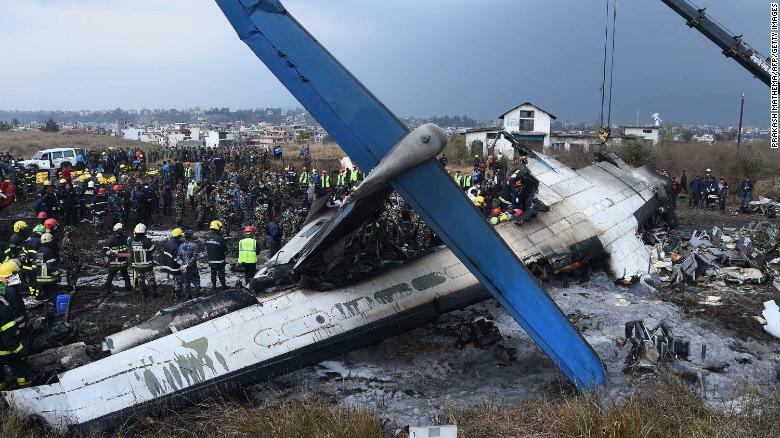 At least 49 people were killed when a plane approached the runway from the wrong direction, crashed and burst into flames while landing at Kathmandu's Tribhuvan Airport in Nepal on Monday. "The plane had permission to land from the southern side of the runway but they instead landed from the northern side. Authorities do not know why they did not land from the southern side," Chhetri said. The aircraft's two recorders the cockpit voice recorder and the flight data recorder have both been recovered. Nepal's recently elected Prime Minister KP Sharma Oli visited the crash site to take stock of the situation. "I was on my rooftop that overlooks Kathmandu from the top of the valley -- I spend most of my time there -- when I saw the plane flying at very low altitude," she told. "It was flying northwards and it was much too low. I thought at first that maybe it was extra cloud cover that was forcing the plane to fly low. Then I saw the plane change direction almost completely and it was flying straight towards us. Then it lost more altitude and finally crashed. "I saw one spark, or flash. Then seconds later I saw another bigger one. It was almost as if the plane might have bounced. Then no more light but a tall billow of thick black smoke rose in the air," she added. "We had done boarding, waiting to take off and then a 70-seater ATR plane was approaching to land and everyone in our plane started to look towards it. And then 30 second later there was smoke," traveler Shradha Giri, who was at the airport waiting for a domestic flight, told CNN. ATR is a Franco-Italian aviation company known for its turboprop planes. According to Flightradar24, the plane was a Bombardier Dash 8 Q400, which the company describes as "the world's most modern turboprop."